I have three rosaries. My first rosary was given to me even before I was a Catholic at the Abbey of Gethsemani. My second and the third ones were given by my spiritual mentors from the catholic church where I was confirmed in Hawaii. They gave me the rosary each time I left the island. But my all-time favorite is the first rosary. Not only because it was the first one, but because of the story belongs to that rosary. 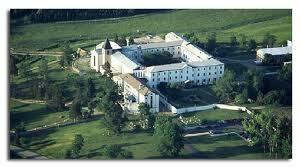 I was on a silent retreat at the Abbey of Gethsemani. Inspired by Thomas Merton, I’ve always wanted to visit that place. After months of waiting for the silent retreat week that I have reserved, I was finally on the ground of the Abbey. My dream land. Who cares about Disney world? It was heaven on earth for me. Liturgies were sung seven times a day, in between, I would walk around the property with book in my hand. But I was so mesmerized and taken with the sense of infinity that resides there so plainly, I couldn’t keep my mind on the book. My mind was up there, high above, flying very high. On day one, I attended the conference for the retreatants that arrived that day. That’s where I learned about the short hiking course, about a mile long in the woods adjacent to the monastery. Despite my fear of hiking in the woods alone(I am directionally challenged and very prone to get lost), I decided to face my fear. So with one bottle of water and no food in my bag but a book and a bible(I figured, it’s less than a mile hike. Come on. I can ride my road bike for 30 miles without eating anything.) I took off, alone, into the woods. I would not come back until five fours later. What happened is I was so taken up in the present moment, I wasn’t watching where I was going. I was enchanted with the scenery and the beauty of being in the nature alone away from the society. I took many pictures with my digital camera, and even wrote a poem in honor of my friends who were getting married that weekend. Maybe an hour passed like that. I started to realized that I haven’t seen anyone along the trail. I looked around and there were no sign posts directing me the way back. I felt like I should be back already, but I was nowhere near where I started by the way it looked. I had no idea where I was. I grabbed my cell phone but it had no service. Fear kicked in very fast as I made sense of my situation. ‘Am I lost in the woods? I started running around, looking for any signs. Nothing. I came across a sign that I was not looking for. It said, “Do not trespass.” I had to. I had to do everything backwards in order to find my way back. In panic, I started to scream. I have never been so loud in my entire life as I was at that silent retreat. A couple of hours passed like that. I kept checking my cell phone to see if I get any signal at all. My battery was draining fast as I kept dialing 911 with no success. I had to do something. After all, I was on a monastery property, and if God would perform any wonders, it was a perfect place for miracles. I honestly believed, that if God so chooses, He could successfully connect me to the 911 respondent without any connection signal. Drenched in sweat, and intense fear, I was starting to get hungry. My water was gone by now. My whole body was shaking but I couldn’t tell if I was shaking from fear or hunger. Just then, I came to an open area. It was a small circle of vacant land where it wasn’t surrounded by trees. I opened my cell phone. I got the signal. I dialed 911. They couldn’t located where I was, and neither could I. But I had a brilliant idea. I pulled out my digital camera, and traced back the pictures that I took along the way. I took stone house picture at 1:45. I took the barn picture at 2:30, and so on. I told them about the milestones and sights that I have passed along the way and the time I captured those pictures. I think I might be able to remember how to go back to the last milestone that I have passed. I said, even though I was not entirely sure. It would soon get darker. I would have to do something so that they could find me. Do that, we will find you. I started running again. And screaming. Help! Anybody out there! Help! I yelled as loud as I could. A son of a farmer from a farmland near by, he was visiting his parents from a distant city. I grew up hiking here. I know the backroads, he said. He walked me back to the monastery, but soon we heard the 911 respondents. They came on ATV directed by a monk who built the hiking trail. I was beyond embarrassment and. shame. But also, so much gratitude for the way things turned out. We came back to the monastery. The monk told me never to hike alone again. At least let someone know that you are going, he suggested very gently. I went back to my room, and ate some snacks and fell asleep fast. I slept until the next morning until it was time for the first hour of prayer that starts at 3:15AM. When I was getting ready, I heard some sound coming from the door. Someone was outside. But it was the monastery and I had nothing to fear. I got ready and left the room. There was a beautiful rosary hanging on the door nob. I instantly knew it was from Brother Rene. He was the first monk I ran into at the Abbey that day I got lost. I was in the retreatant’s library, and he was walking to where he was going. He was a small man, with a crooked back at an old age, but he had one joyful spirit. I felt so drawn to him. I walked up to him when our eyes met, and asked for a recommendation for a good book to read while I was there. Such a sparkle he had in his eyes! I thought, if I ever had a grandpa, I want him to be just like him! If I had a grandpa, maybe I wouldn’t have been as lost as I was. Growing up, I never really had any solid love. My mom and dad were always at war, mostly triggered by my dad’s alcohol problem. I know they loved me. But the peace their love could bring into my world was hard to find on most days. I didn’t have a grandpa to run to. I did have grandmas, but they were in need of care and protection themselves. I saw Brother Rene again on my next visit to the Abbey. It was right before I moved to Hawaii. I once sent a box of Macnuts from Hawaii to the monastery along with a postcard to Brother Rene. He was always in my heart, and I thought about him often whenever I thought about the peace I felt at the abbey of Gethsemani on my hard days in Hawaii. When I finally moved back to Tennessee, my first plan was to go to the Abbey. But I found out that Brother Rene had passed away the year before. He had been suffering from cancer. So that’s my first rosary that I cherish. Given by a dear, dear monk, with a joyful heart after enduring my fearful heart for hours in the woods. The rosary has been my guide ever since. Oh yes! I adore this rosary. So special. You should write about your rosary story one day. I would love to read about it! Lily boat, I stumbled upon your blog and read this delightful story. I would love to have you upload a picture of the rosary Brother Rene gave you.It would be fascinating to see which one he gave you. Thanks for this great story it truly sound our dear Brother Rene. Everyone with whom I’ve shared this story have loved it. Mark, thank you so much for stumbling upon my blog! I promise that I will post that picture later today! It will also give me great joy to present this precious rosary to others. Perhaps, you could tell me more stories about Brother Rene. I wish I had known him more. I shall always cherish his memories! 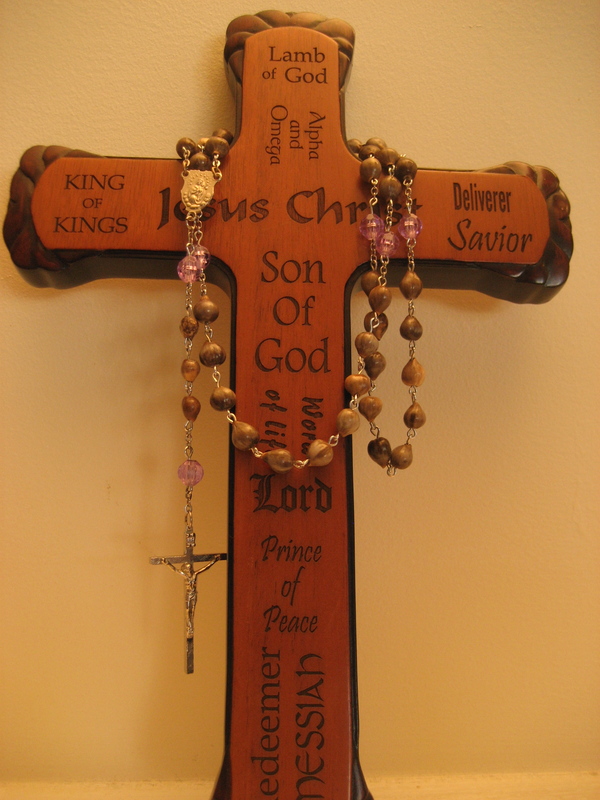 Thanks for uploading the picture of your rosary! It is really beautiful. I knew Brother mostly by correspondence but was the object of his great charity of heart. We will console ourselves with the memories we have of our dear Brother Rene. Oh how lucky to receive his pure love! I was glad to show the rosary to you. God bless!